Published on July 8, 2016 August 25, 2016 by Nieves I.
Pineapple melts tummy fat when you eat it instead of high calorie desserts. Eat you protein, veggies and fruits and you can have a lean body. Pineapples can help you lose weight. They have a lot of water, fiber, minerals and digestive enzymes. They have few calories: Only 70 calories per 100 grs!!! (4 oz). They have lots of fiber which will be used to help you feel full faster and also have a good digestion. The main enzyme is bromelain that helps in the breaking down of protein. 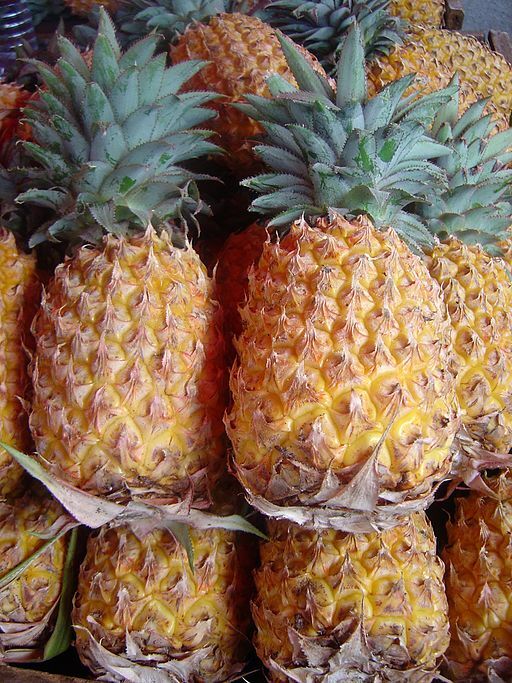 Bromelain is anti-inflammatory and anti-cancer, anti- arthritis. 100 grs. of pineapple/ half of cup has almost 47 mg of vitamin C. Vitamin C is an anti-oxidant and it is required for the synthesis of collagen, which is in the: joints, skin, hair and nails, blood vessels, organs and bones. Vitamin C protects us against scurvy or soft bones and helps the immune system to prevent infections. Pineapple contains small amounts of vitamin A that is good for a healthy vision, skin, oral health and the protection of lungs. 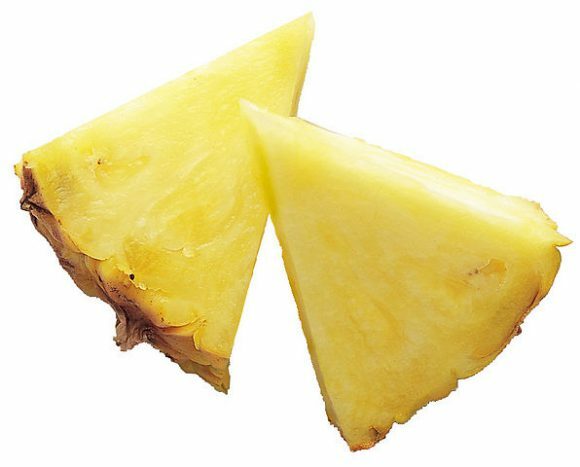 Pineapple has copper that helps in the red blood synthesis. It has Manganese that is a cofactor for the antioxidant; SOB (super-oxi-bismutase); and Potassium, which is important for the acid balance of all the cells… especially the heart. Pineapples have some B complex vitamins such as: folate, thiamin, pyridoxine and riboflavin. These vitamins aregood for the skin, brain, mood and heart. They also regulate the nervous system and digestive system in order to help in the production of energy in the body. This helps all the cells. Pineapple is a great meat tenderizer. However, it can burn your mouth if you eat too much of it. It can also burn your mouth if the pineapple is not ripe. This is why it is important that the pineapple is ripe. In order to determine whether or not the pineapple is ripe, it has to taste sweet and feel soft. The problem of eating unripe Ned pineapple is not serious, but will rather make you uncomfortable. This problem should resolve itself within a few hours. Do not eat the pineapple core! It has a lot of bromelaine, an acid that is capable of burning your mouth which can also cause vomiting, diarrhea, and the creation of fiber balls in the digestive tract. If you want to know if the pineapple is sweet, they have to smell sweet. If they do not smell like anything, they will not taste sweet. There was a Farmer’s Market near my husband’s job. Several times a week he would go there to buy fresh vegetables and fruits. Some days he would bring home sweet pineapples. When you sliced and eat them they tasted delicious. They were very sweet. After the pineapple was sliced, we would eat some chunks and put the rest in the refrigerator. The next day the pineapple would be sweeter. You do not need to put any sugar if the pineapple is ripe. My moms’ parents had a farm and on the farm they grew: plantain, bananas, pineapples, oranges and tobacco. When my mom was a kid she ate one entire small pineapple a day when they were ripe. Her dad would bring a machete and would slice the pineapple in half. He would then cut and trash the pineapple core and finally, he would give her a spoon to eat it directly from the nature’s container. I thought that was very cool. Now you know more about pineapples and why are they good to eat, especially if you want to lose weight. Please, leave a comment about how is this tip working for you, feel free to leave a question in the comment section, or leave a comment if you liked the article. Thanks. I have always loved pineapples but do not eat them as much because they are a little expensive and are not in season for long. Now that I know they are extremely helpful I will be buying them and eating more of them. Yes, Tyrell, pineapple are very healthy and help with weight loss. Look for the ones that have a sweet smell or let it mature at home. Thank you for your comment.